This walking tour takes visitors around the area of Seochon Hanok Village, a traditional Korean village located to the west of Gyeongbokgung, home of the middle class during the Joseon Dynasty and some of Korea's most important modern cultural Figures. The Site of the Tongui-dong Baeksong is where a baeksong (white pine tree) once stood in the neighborhood of Tongui. 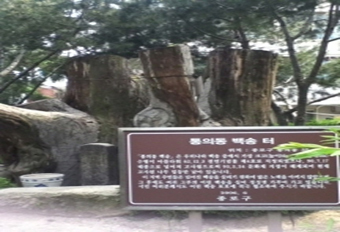 Only a few of this variety of pine tree grow in Korea, and this particular baeksong was once the largest in the country and was designated as Natural Monument No. 4 on December 13, 1962. Unfortunately, it withered away due to a typhoon in July 1990 and its designation as a cultural asset was cancelled and only its stump remains. Tongui-dong Hanok Village is a traditional Korean village in Seochon where middle-class professionals such as language interpreters and medical doctors once lived. 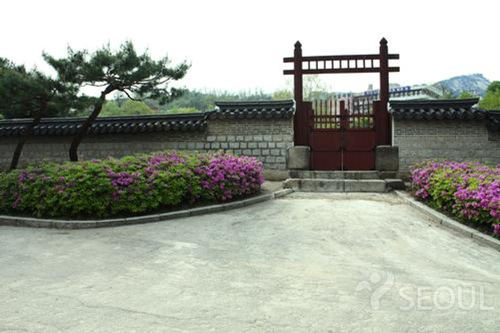 It was the home of several famous historical Figures including "Gyeomjae" Jeongseon and "Chusa" Kim Jeonghee during the Joseon Dynasty; and painters Yi Jung-seop and Yi Sang-beom and poets Yun Dongju and Yi Sang in modern times. 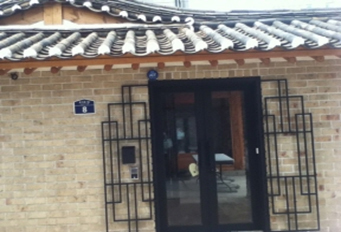 Most of the remaining hanok are "gaeryang hanok", which were largely constructed after the 1910s according to a government housing plan. Paiwha Girls' High School Saenghwalgwan is a multi-purpose hall located on the school grounds of Paiwha Girls' High School, a school well-known as the alma mater of late Lady Yuk Yeong-su, the assassinated First Lady of Park Chung-hee. The building was originally built as the living quarters of the school’s Western missionaries in the early 20th century and displays the characteristics of Western missionary architecture from that time. Opened in 1922, Sajik Park was built around the Sajikdan, a stone altar that was erected in 1395 by King Taejo, the founder and the first king of the Joseon Dynasty. It was built to worship the gods of the Earth and harvest and rites wishing for a good harvest were held regularly there. It was designated as Historic Site No. 121. 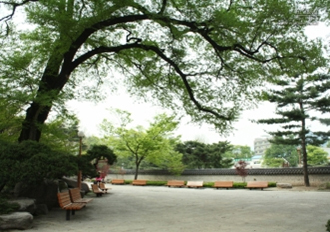 Sajik Park features the most historic treasures of any Seoul park. In addition to the Sajikdan, the main gate of Sajik Park is designated as National Treasure No. 177. The park is also the location of the Jongmyo (Royal Shrine), designated as a UNESCO World Heritage Site for being the oldest royal Confucian shrine preserved; Dangunseongjeon (Dangun Shrine), a shrine that honors Dangun, the legendary founder of the first Korean kingdom; Hwanghakjeong (Yellow Crane Pavilion), an archery field that was built at the command of King Gojong (the 26th King of the Joseon Dynasty) in order to preserve the tradition of archery; and many other historic landmarks.